This view from the Viking 2 shows Utopia Planitia on Mars in 1976. Some researchers think that the Viking lander's main instrument may have burned up organic molecules in collected soil samples. A technician checks the soil sampler on the Viking Lander in 1971 before the probe traveled to Mars. Some scientists think that the organic molecules in the soil samples collected by the lander were burned up accidentally. A possible explanation arose when NASA's Phoenix lander found perchlorate on Mars in 2008. This is a salt used to make fireworks on Earth; it becomes highly explosive under high temperatures. 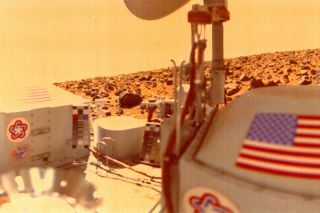 And while the surface of Mars isn't too warm, the main instrument aboard the Viking landers, the gas chromatograph-mass spectrometer (GCMS), had to heat the Martian soil samples to find organic molecules. And because perchlorate is in the soil, the instrument would have burned up any organics in the samples during this process. The discovery of perchlorate reignited scientists' convictions that the Viking landers could have found organics on Mars. "You get some new insight, and you realize that everything you thought was wrong," McKay said. However, finding perchlorate didn't provide concrete proof that the Viking landers found and accidentally destroyed organic molecules, so the investigation continued. Guzman said she still isn't completely convinced that the chlorobenzene they detected formed when organics in Martian soil were burned. She said that the molecule could have come from Earth aboard NASA equipment. But despite this skepticism, others are convinced; "this paper really seals the deal," Daniel Glavin, an astrobiologist at NASA's Goddard Space Flight Center who was not involved in the study, told New Scientist.